We picked up about 3 inches of snow Saturday night and then about an inch between yesterday and today. I walked part of the trail that goes on our property and there’s 5-6 inches of snow on it. Clubs have been doing some panning and rolling to pack down the trails and start building a base. 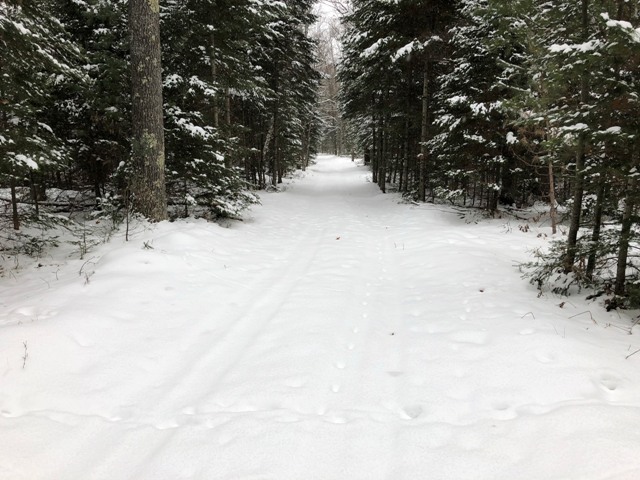 We still haven’t been able to find a target date when the trails can officially open (provided we have adequate snow). The lakes are ice covered. We measured 6-7 inches of ice in front of our place today and have pockets of slush that have formed. Stay off lakes until they are marked.